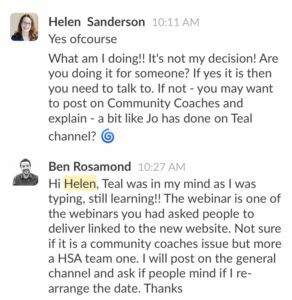 Over the last month I have posted about why we were considering Teal, how we decided to ‘go Teal’ and our first meeting Tactical Meeting. The true test of any purported change is whether it makes any difference to people’s behaviour. This is what I have noticed over the last 3 weeks since we decided to become Teal. How has my behaviour changed? I have been trying to step back to make space for others to step up. I have not always managed this, and have apologised when I have got things wrong and gone back to the ways we used to work. I introduced a blue (tealish) swirl to my posts on Slack (our team communication app) to make it clear when I was consciously trying to act differently. 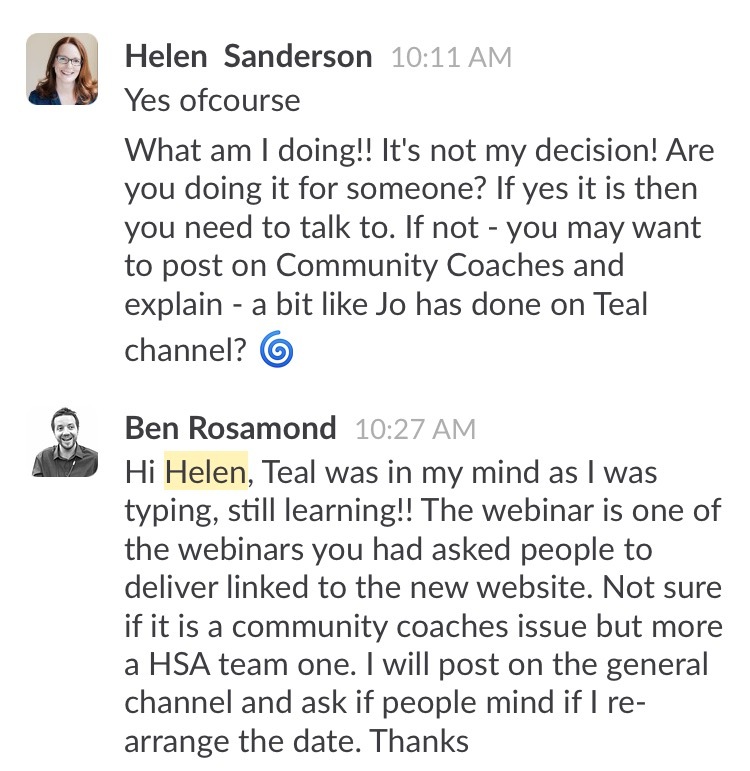 Ben emailed me about something he had committed to, a webinar on Groupsite. He was struggling to complete to the deadline because of a commitment to a customer. He contacted me to tell me and asked if it was OK to postpone the webinar. I said, “Yes, of course.” And then I stopped myself. Ben was behaving as if he was accountable to me, and not the team – and I had colluded with that. I quickly responded back that it was not my decision, and suggested he asked the team instead. Michelle emailed me to ask if she could use some of Adam’s time to share some stories she has been working on with colleagues in Dumfries and Galloway. I simply emailed back with “Why are you asking me?”. In hindsight that might have sounded a bit sharp, and we went on to have a conversation reinforcing how everyone is able to use the team resources (like Adam) without asking my permission. What am I noticing in other people? Jo led on this with by posting how she was behind with a team commitment and wanted to let people know about this. She struck the perfect balance of being accountable, and not asking for sympathy as she shared the family reasons why it had been difficult to complete on time. Two other team members made similar posts about commitments that they had not been able to fulfil. In the past, either I would have spotted that these tasks had not been completed and individually contacted people, or people would have contacted me to let me know but not the team. This is a significant change. I have also seen signs of people ramping up their personal accountability, reading and re-reading Reinventing Organisations. You know someone is serious about this when they read ‘Getting Things Done’ and buy a labeller! Gill posted a question to the group that previously she would have just asked me. Before Teal, all ideas for projects would have gone through me or been checked by me. Gill started one around train the trainers for person-centred thinking and invited people to join her. Rob made thoughtful and challenging posts about Teal. It is so important that although we have made a decision, people express concerns and questions, and so this is a real positive. Rob described himself as ‘jogging alongside the Teal train rather than leaping on board’ and shared a post about Zappos – a company that has adopted Holacracy – and shared some of the critical feedback about their experience. I couldn’t quite manage not being the first person to respond to this! 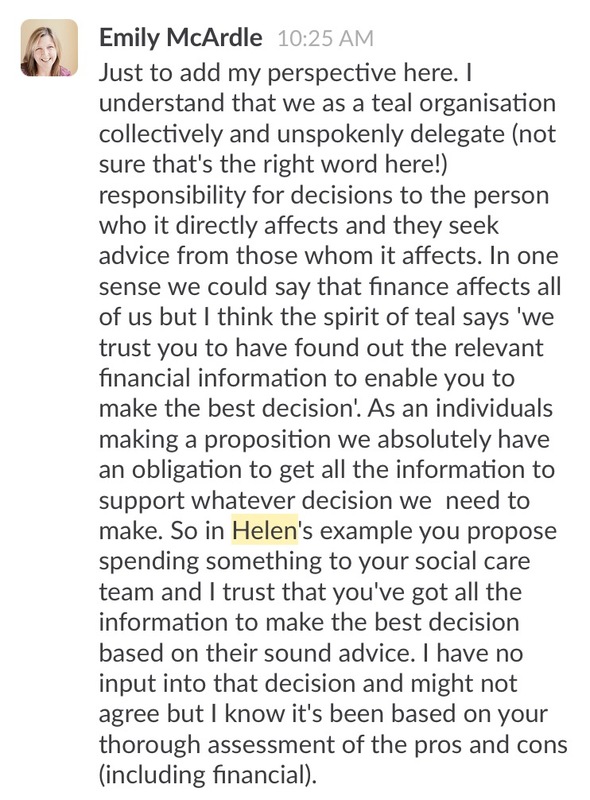 That said, Emily also gave a clear response on how she saw decision-making around finances happening. We use Trello as a way to share progress on projects and we have a board with the BHAGs (Big Hairy Audacious Goals from the work of Jim Collins) of each of our leadership areas. Gill asked about updating this and I said it was something we had done when we were still doing BHAGs, and questioned whether we still needed to keep it updated. Going further would mean people changing things that I had done or set up – for example, Gill saying no we no longer need that Board, or asking the team about it, and then deleting it. I don’t think we are very far off that. 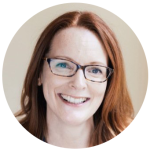 Michelle will be doing the Holacracy practitioner course over the summer (as promised in my other blog) and four of us who are interested in Holacracy are starting coaching sessions with Susan Basterfield to help us embed our Teal practices further and confidently and competently introduce elements of Holacracy. 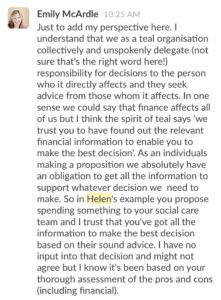 We’re learning that moving to Teal means a real change for all team members in how we work together, lead projects and make decisions. I’m learning that it’s important to be conscious of old behaviours, so I don’t slip into them without noticing. Most of all, I’m learning that the team as a whole is embracing this change, and it’s having a positive effect on our accountability, commitment and decision-making process. As I’ve read in another blog post, ‘The Future of Management is Teal’… and I’m excited to see where it takes us next.